Sunday, January 2, 2011: HomeAdditionPlus.com released today its latest do-it-yourself instructional guide, the “Installing Baseboard Trim Ebook”. 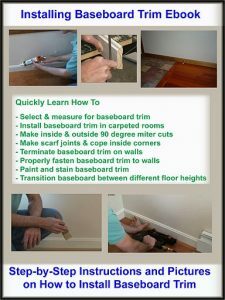 The “Installing Baseboard Trim Ebook” is a comprehensive, yet easy-to-read guide, for the do-it-yourself homeowner who is planning a baseboard trim installation project, and who wants to quickly learn the secrets to ensuring a professional job. It is packed with instructions for every phase of the project, from measuring for baseboard trim, to applying the final finishing touches of paint or stain on the installed trim. It also includes detailed instructions on how to make the various types of mitered cuts, including coped, scarfed and square cuts. Though the installation of baseboard trim is not an art, it does require some basic carpentry skills and the right tools to prevent amateur results and a small fortune in wasted material. The “Installing Baseboard Trim Ebook” provides detailed instructions for every step in the process of installing baseboard trim and includes 18 instructional pictures, so that the DIY homeowner achieves a quality finished baseboard trim installation project. It also unveils the secrets on how to cut baseboard trim properly and make perfect mitered, coped and scarfed joints. It shows how to splice long lengths of baseboard trim together, and miter inside and outside corners so that the joints are nearly invisible. It also provides instructions on how to terminate baseboard trim for the situations where the trim needs to abruptly end along a length of wall. As with every section of the Ebook, detailed instructional pictures accompany the paragraphs to aid in quickly understanding how to make tight joints. The Installing Baseboard Trim Ebook is priced at $15 and can be purchased online at Installing Baseboard Trim Ebook and is immediately downloadable. About HomeAdditionPlus.com: HomeAdditionPlus.com is owned and operated by DIY HomeAdditionPlus.com, and is the home improvement resource for finding accurate and helpful information on home improvement, home remodeling, and home building topics.